Easy Potato Salad With Eggs – Best Potato Salad Recipe Ever! This easy potato salad is the best potato salad recipe ever! 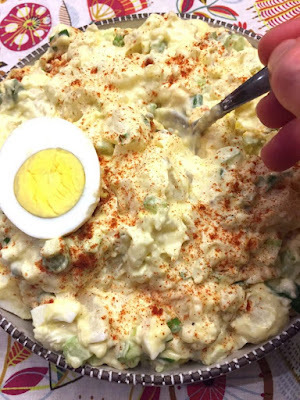 Once you try this amazing recipe, you’ll never have potato salad any other way! Secret ingredient is revealed below! This easy potato salad is truly the best potato salad recipe ever! Once you try this amazing potato salad recipe, you'll never make potato salad any other way! Secret ingredient makes it perfect! Bring a pot of salted water to a boil. Add potatoes and cook for 25 minutes. Drain and cool for 15 minutes. Cut the potatoes into ½ inch pieces. Put potatoes in a large bowl, drizzle with white vinegar and stir. Chop the eggs and add to the potatoes. In another bowl, mix mayo, mustard and sweet pickle relish. Add the mayo mixture to the potato salad and stir to combine. Put the potato salad in a serving bowl and sprinkle with paprika.